The E-Stim Torpedo BiPolar Insertable Premium Electrode. 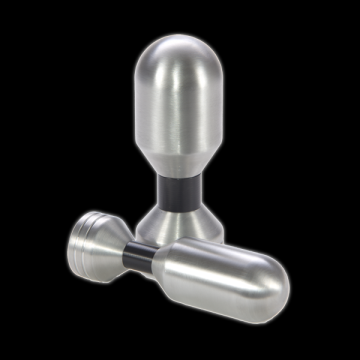 Torpedos are part of a whole new range of E-Stim insertables that offer a more filling penetrative estim. Measuring up at 130mm in length with a 38mm head diameter (small) and 135mm in length with a 50mm head diameter (large). The small and large torpedo electrodes are just the beginning of this range large mass head penetartive estim insertables. With the bulk of the mass in the head, they readlly do offer more of a filled penetration, the slim next ensures they stay in place once inside you. The base enures it stays in placed when fully inserted and is also grooved to proved greater grip for easy insertion and removal. You will need an E-Stim 4mm cable to use with your torpedo or for the large torpedo you can also use the 4mm low profile cable. Metric Length: Small - 130mm, Large - 135mm. Head Diameter: Small - 38mm, Large - 50mm.